Bhekinkosi Shadrack Ngema, popularly known as Magubane from Emzini Wezinsizwa, died from a heart attack on the 5th of December 2015. He will be laid to rest at Ndwedwe on the 12th. Image: Youtube. 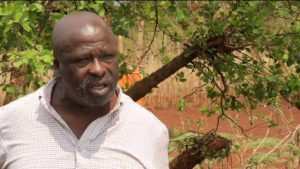 Former radio announcer and actor Bhekinkosi Shadrack Ngema, who died from a heart attack last week, will be laid to rest on Saturday (12 December 2015) at Ndwedwe, north of Durban. His funeral service will be held at Ethekwini Community Church at 8:00 am. Ngema, who recently retired from uKhozi FM, died on Saturday last week at Prince Mshiyeni Memorial Hospital in Umlazi after complaining from chest pains and dizziness. His death came as a shock to the whole country, especially the sporting fraternity. Mshedisi, as he was fondly known, worked for decades as a radio broadcaster and sports announcer on uKhozi FM. He also worked as an actor on TV and in radio dramas. On TV he is best known for his role as Magubane in the SABC 1 sitcom Emzini Wezinsizwa. Ngema’s death comes a few months after that of his former colleagues Bafana Mlangeni (Sibeko) and Roland Mqwebu (Mkhize), who died in July and August respectively. Tributes have been pouring in since the news of Ngema’s death emerged last week. His former colleagues described him as a funny person who was a pleasure to be around, adding that his death was a major loss to the station and the nation at large. Among those who sent their condolences was President Jacob Zuma, who described Ngema as a “very talented and popular actor and comedian”. “South Africa has lost a familiar voice and face in the arts industry. He was a very talented and popular actor and comedian who brought laughter and joy to our people. He will be sorely missed. We wish to convey our deepest condolences to his family. May his soul rest in peace,” Zuma said in a statement. Phumula kahle Ntusi yenkomo ubusikitaza kamnandi emzini wezinsizwa.May your soul rest in peace.